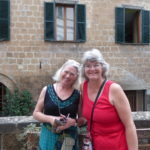 It’s been a lovely time painting and relaxing in Umbria and Tuscany Italy. I brought my watercolor journal and a few painting supplies. 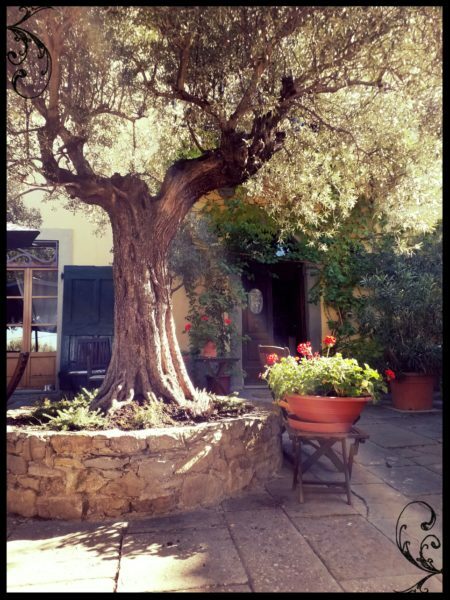 Relaxing with a glass of wine on a sunny, warm Terrace, I was able to paint this beautiful scene at our little villa just outside the walled city of Cortona, Italy. My journals have become my diaries. I call them visual diaries. Painting is my specialty and not really writing. I would rather paint, draw, and experiment with mixed media. 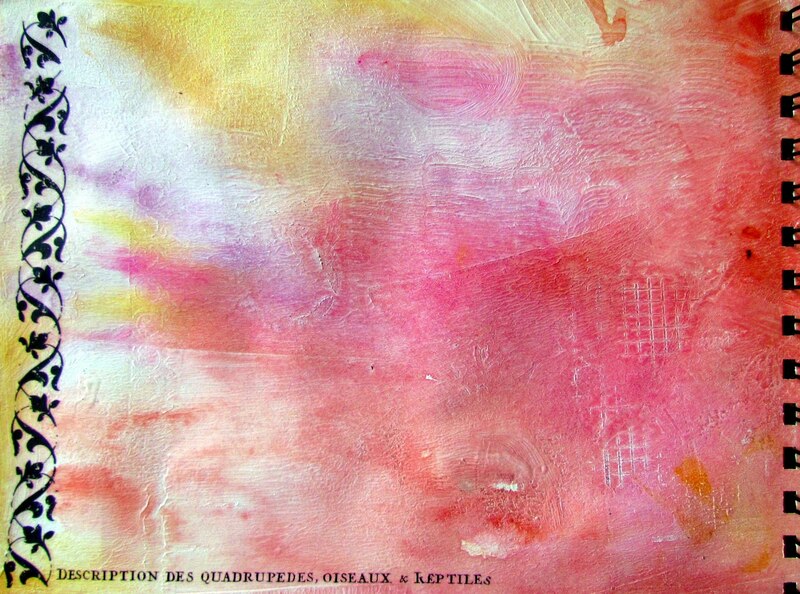 Therefore, art journals are not so much about making art but recording my life in a colorful way. 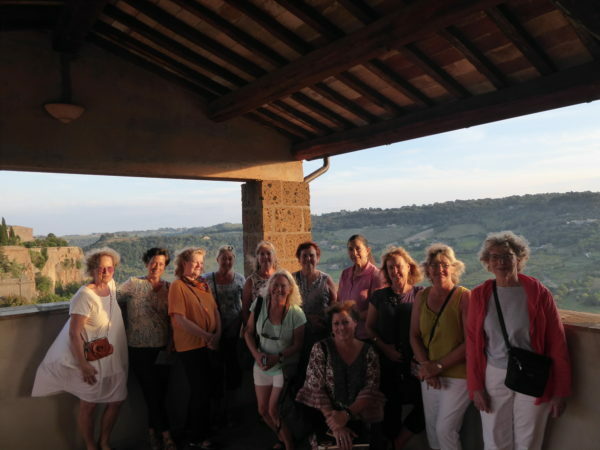 I am with a very enthusiastic and fun group of artistic ladies: painting, wine tasting, exploring, laughing, and learning about the rich history of Orvieto Italy. 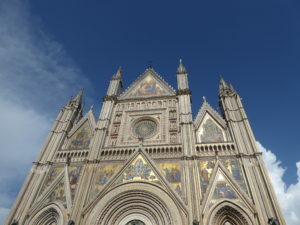 Yesterday we had a fantastic tour of the very impressive Duomo. The labyrinth of caves underneath protects it from earthquakes. They provided shelter during war times. 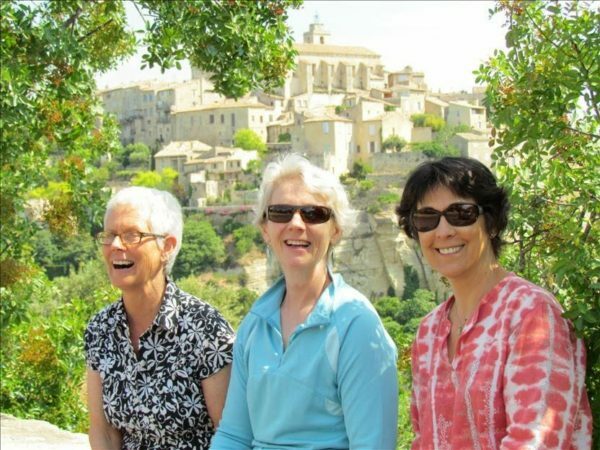 Join me on my next wonderful watercolor, art, and painting workshop in France. We will be on an artistic journey of creative expression! 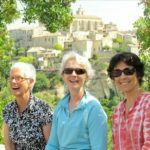 Our home base will be a charming medieval village in Provence, as we have fun painting and creating art in our watercolor journals. 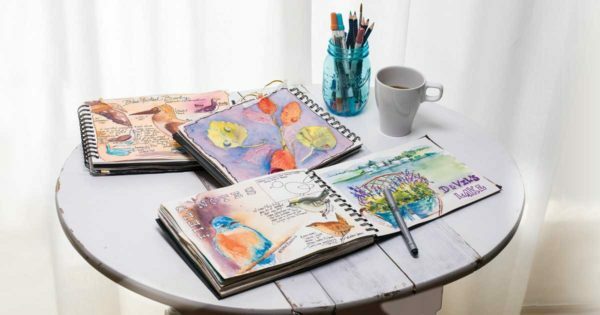 You will learn to incorporate watercolor and mixed-media techniques. 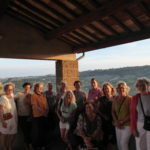 We will spend a magical time together exploring the area, rich with sights, sounds, and colors – all wonderful inspiration for developing your artistic eye. Our host will be frenchescapade.com. 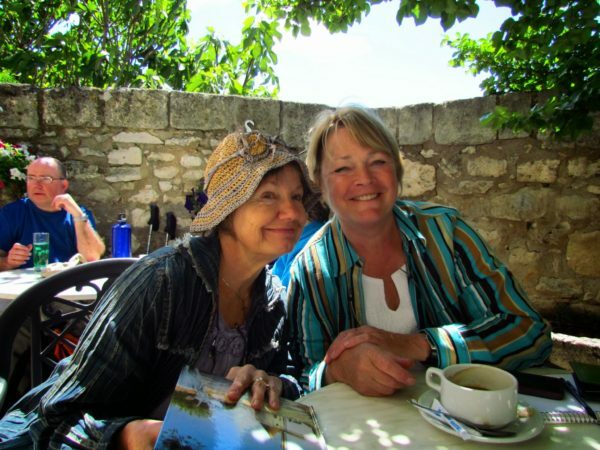 They will provide many delicious meals cooked by a French chef and transportation to painting sites. 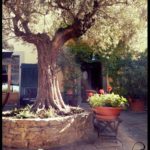 We will stay in a charming hotel with a little river meandering through the garden. It also has an outside swimming pool, a hot tub, and a riverside terrace bar all surrounded by impressive mountains. 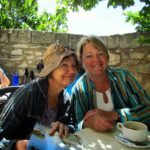 This workshop is available for all levels – beginners and experienced artists are all invited to come along on this delightful trip! 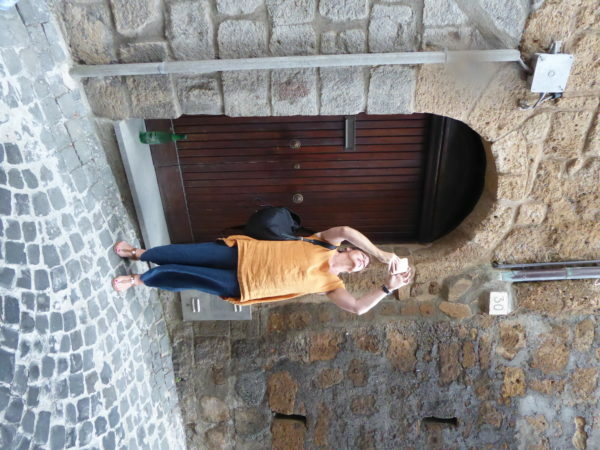 Once in a while, I like to share travel tips for the traveling artist. I call these Watercolor Journeys Travel Tips. I always take a watercolor journal with me when I travel. 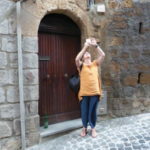 I am always looking for some smart, fun travel ideas for my supplies. This Watercolor Journeys Travel Tips is the Nomad Box Pen Case. Here is a great zippered bag to hold a lot of art supplies such as pens, pencils, tubes of paint, erasers, small ruler or small scissors. You can get them at one of my favorite online stores, JetPens for pens and such. It is a Nomad Box Pen Case. This stylish, large-capacity pen case opens wide. It stays open so that you can easily pick out the pens you need. Wide-opening main compartment that stays open on its own and holds approximately 30 pens. Three pockets inside the main compartment for organizing small items like erasers, lead, and sticky notes. There is one large mesh pocket and two small fabric pockets. One large outside pocket for frequently-accessed items. A loop on one end for fastening the case to a clip, hanging it from a hook, or for using as a handle. 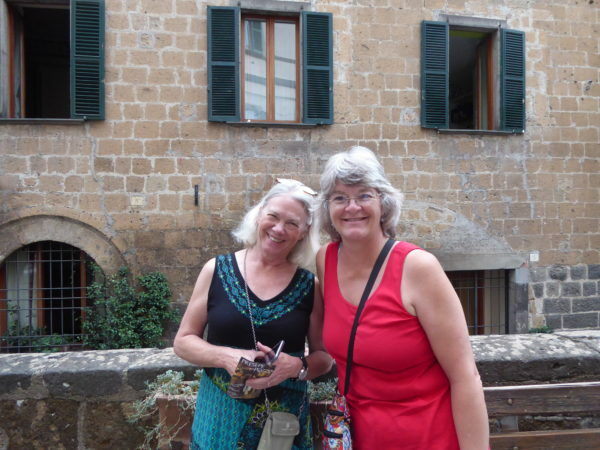 Artist Jacqueline Newbold enjoys painting life in color! 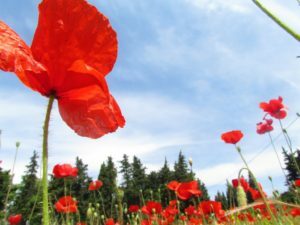 Her color-filled watercolor paintings capture a moment in time – sunlight on red poppies, the glow of a Tuscan village perched on a mountaintop, or the brilliance of a dramatic Oregon Cascade Mountain sunset. 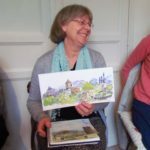 Jacqueline loves to share her passion for watercolor painting and mixed-media art journaling by teaching in her Art in My Heart private studio, the Art Unraveled Art Retreats in Phoenix, the Art & Soul Retreats in Portland, Oregon, France, and Italy. 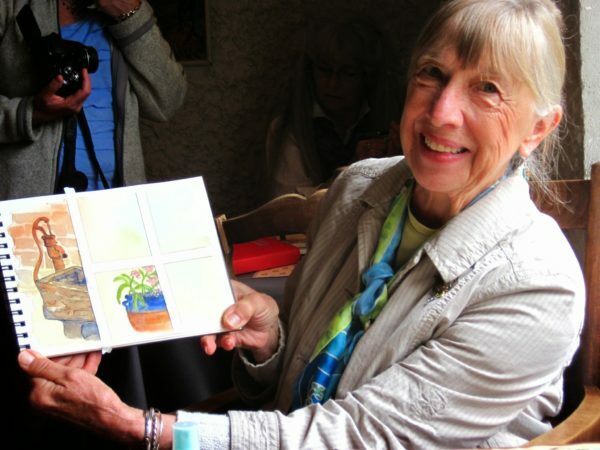 She teaches private watercolor lessons, classes and workshops in her private art studio in Bend, Oregon. 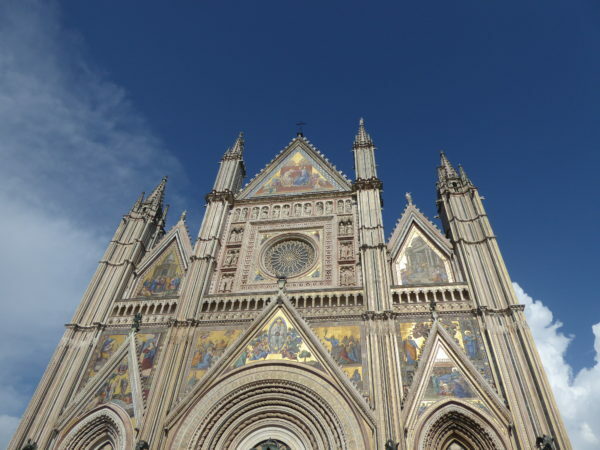 Stay tuned for more Watercolor Journeys Travel Tips! Do you enjoy the anticipation of an upcoming vacation or trip? Do you practice packing your suitcase with your favorite clothes? To me the journey begins way before walking out the door, suitcase in hand. I love preparing my art supplies for my travels. 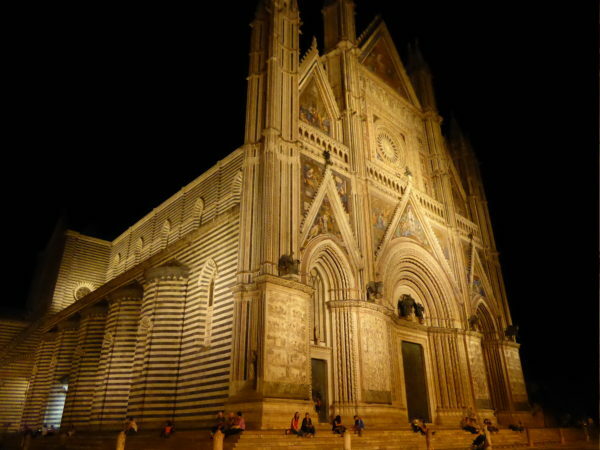 Planning for my upcoming trip, Painting the Italian light, Orvieto, Italy. 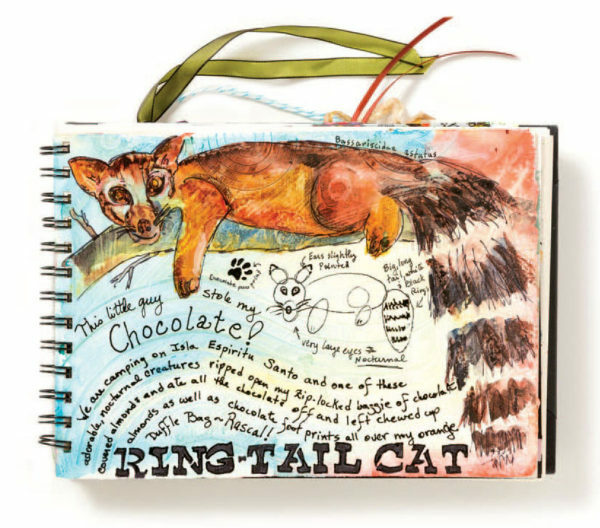 My smaller journal is a Strathmore 400 Field Watercolor Sketchbook. For years I have had a love/hate relationship with the Strathmore field book. Every other piece of (crappy) watercolor page alternates with a piece of drawing paper. 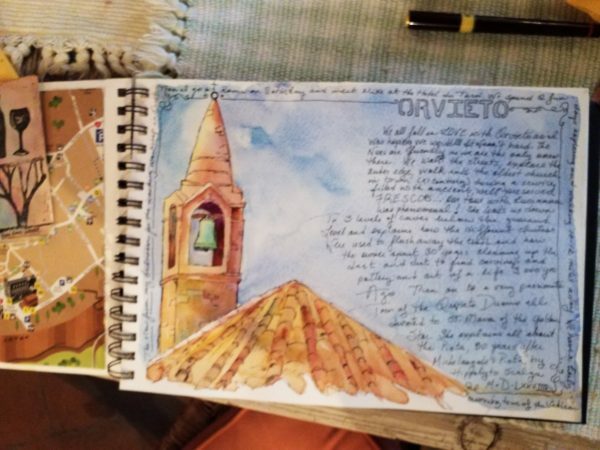 This drawing paper is where my mixed-media imagination soars and I have probably filled at least 20 of these journals with art from my travels. First page in my new journal with inspiring quote. in order to compensate for the not so great watercolor paper I tear my Strathmore Sketchbook apart. I kept the metal coil and the black hard covers. I filled it with Arches 140 paper alternating with Strathmore 400 series drawing paper. 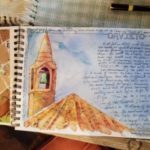 I prepared the drawing papers with colorful backgrounds and finished the first page with an inspiring quote for my upcoming trip: “To Paint…. to travel…. 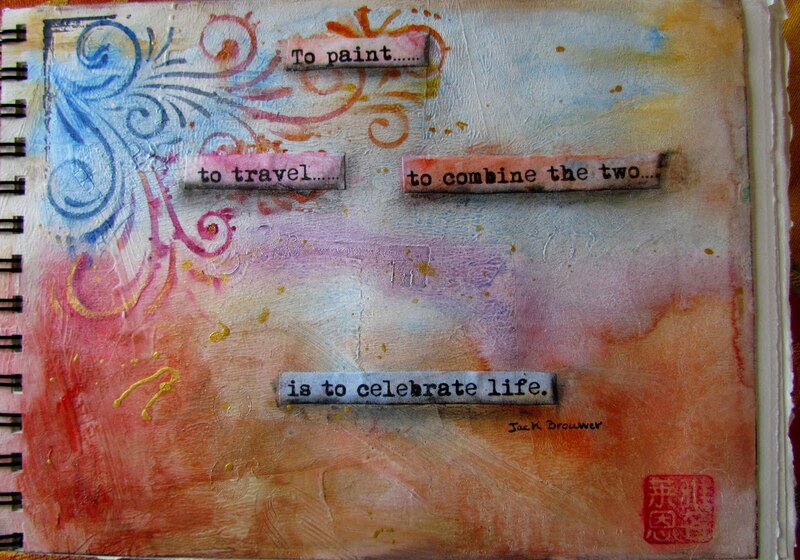 the combine the two is to celebrate life” (Jack Brouwer). Sometimes artists need the inspiration to paint. Maybe it is because we tend to paint the same subject matter, use the same color scheme, or feel like we are not growing in our art. 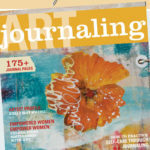 One way to get a jump start on the new day ahead is to browse through the latest issue of the Art Journaling magazine. 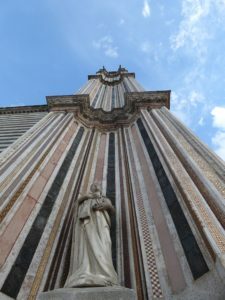 It is always filled with colorful, edgy, creative art. 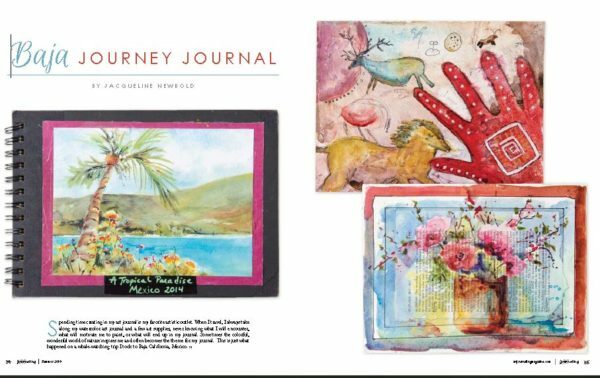 I am excited to say that my Baja Journal is featured in the latest issue of Art Journaling! 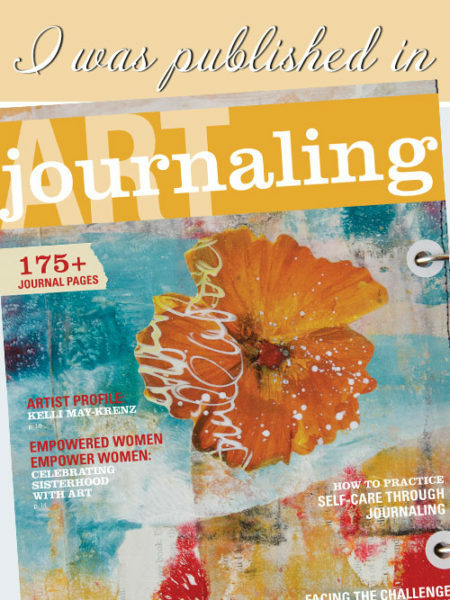 This is the cover of the new Art Journaling magazine published by Stampington and Co. I love seeing the brightly colored orange flower against the powder blue background. 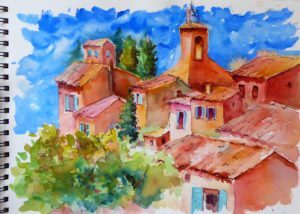 It is so simply painted and with the added splashes of white paint, the artist makes it look loose and lively. Why not try painting this flower to get you started on a colorful day! Simple, colorful and fun. 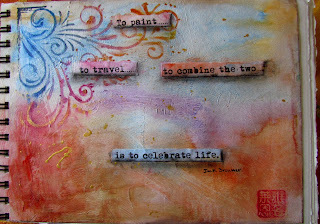 Another idea for finding inspiration is to paint along with an art DVD. 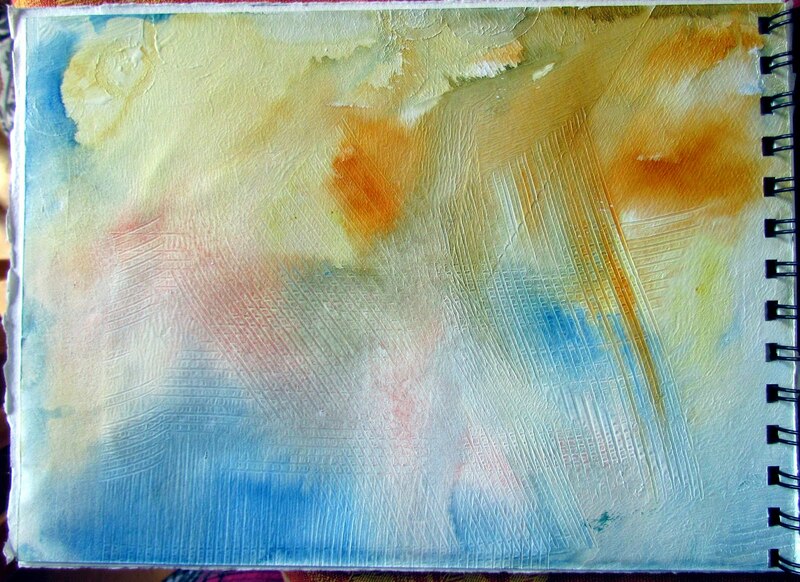 I have several available for purchase with the online shop at the Artful Gathering the online art retreat. Check it out! 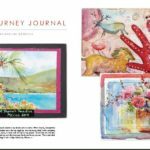 Art Journaling Summer 2018 Magazine Available July 1st! 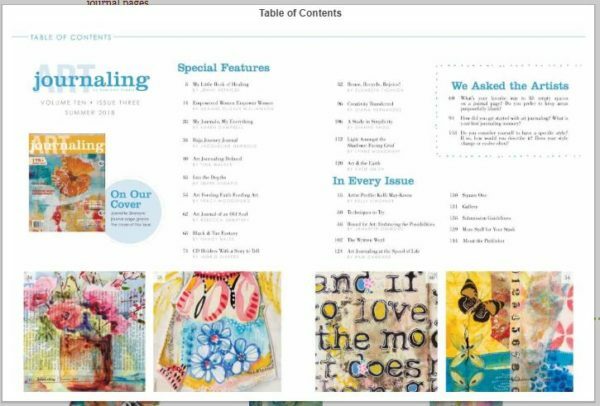 Just out is the new ART JOURNALING MAGAZINE. 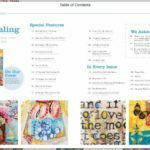 The new Stampington Magazine is available for purchase. 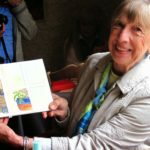 My article, Baja Journey Journal, is about including flora and fauna in my watercolor art journals. 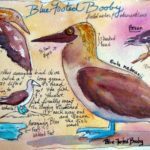 I show how I use field notes to collect information about the birds and animals that I observe. 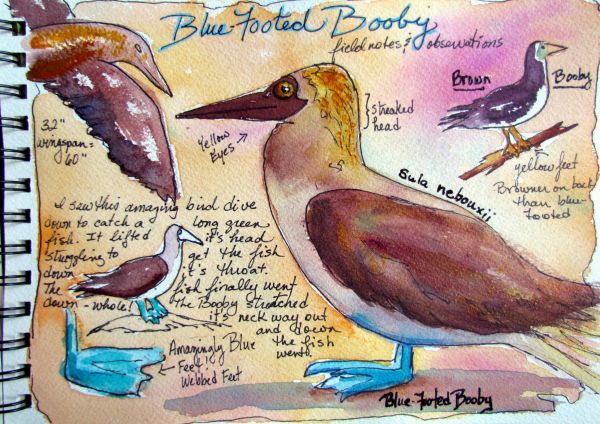 The field notes are helpful to my paintings and drawings.